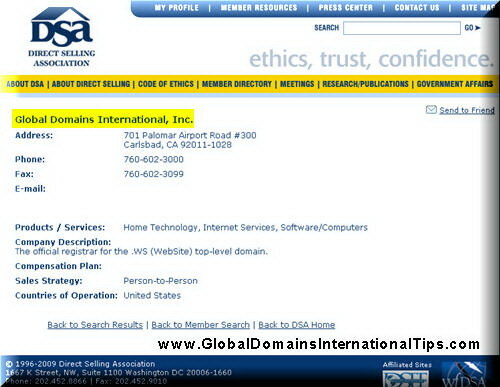 Which is the Best Way to Promote Global Domains International? If you have a large network of offline friends or you meet a lot of people offline, you may promote GDI offline to them though personal meeting and gatherings. That is why GDI produced the videos (DVD) that you can purchase (at a very low price) to send out to your prospects offline. The videos will have your username embeded so that when your prospects try to sign up online, they will enter your username and you will be credited with the sale. To compensate for this extra work you are doing (buying the DVD) GDI have arranged a Bonus Plan where you can get $100 Bonus for every 5 new sign-ups within a week. You can read more about the Bonus here. I have seen many less online countries such as Thailand where many are still not “always online” and yet able to see the opportunity on top of the board receiving weekly bonuses with this kind of promotions. 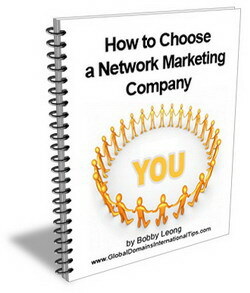 If you are already in MLM or network marketing busines, then you should already have the network to get prospects. 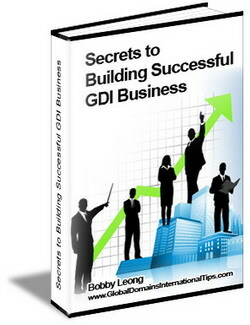 Successful MLM individuals will understand the GDI business and can always add GDI to their portfolio of monthly residual income. Meet up with them and request them to check out your GDI Website or give them a DVD to educate them. 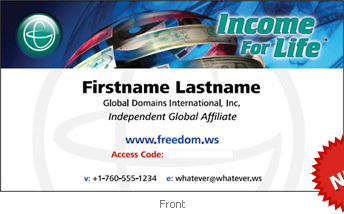 GDI has prepared designs of name cards you can use or order from the members area that you can use to distribute to any potential prospects. You can distribute them anywhere offline where you see potential prospects. You may print and place them in seminars related to business opportunities as some seminar organizers allow and even encouraged attendants to network and share business cards. If not, ask if you can do so. Distribute them in malls or even in your retail outlets. Pass them to friends etc.. I’ll leave it to your imagination. The usual, cheap and free way to promote GDI is through social sites as they cost you nothing and you have nothing to lose. You can easily set up an account at social sites for free and start promoting gdi. When creating an account at social sites, try to use catchy words and phrases too to attract attention and click through. 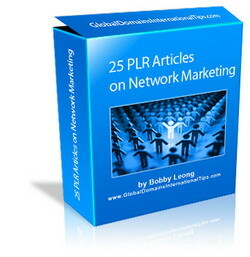 You can download the huge list of social marketing sites here. 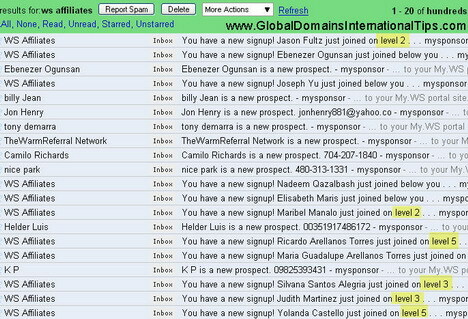 You can even promote trough your facebook, friendster, hi5 and many others which is totally Free. If you are active in Forums, you can promote through them and even include your GDI links in your signature. (please see forum rules for this) The main thing is NOT to spam the forums, by including a catchy phrase like the ones I mentioned above with a link to your GDI website is usually enough. Some more experienced marketers advertise their GDI through the use of online advertising like Google Adwords, Yahoo, MSN etc.. But a word of caution, you may overspend if you are not experienced in using the right words and techniques in online advertising. There are many resources on how to effectively do this but that is another skill you have to master. However, you may want to try it out since Yahoo is giving away $25 credit. 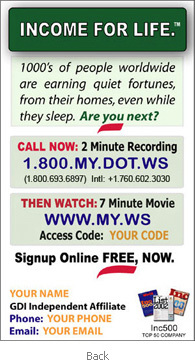 Just remember to stop the ads if you feel you are not doing it right and when your credit runs out. You can get the coupon here. There are also other Free online advertising available such as Craiglist and other Free Classified Ads sites where you can post an advert about your GDI for Free. If you are just starting out online, I would recommend you try the Free methods mentioned above, then try to learn more about the strategies of internet marketing as you go along. The difference between income and residual income? It is when you work, work, work and work for more… and then… it CONTINUES to flow in EVEN when YOU stop working. what kind of paypal should i use?? business? You may use any kind of Paypal account, Individual as well as Business are fine. Before I sign up, I have a quesiton for you guys… Can I produce my own 30 Second TV Spot and air it locally around Texas in order to build downline offline? I own an advertising agency and I was thinking about doing something similar to your video with just me talking on a white screen with some flash text on the side and the web address information. Since I’m in advertising I could easily purchase late night spots for around a buck per and go nuts with this. Please let me know, I would like to sign up, but if you tie these talented hands… it would not be very incouraging. It is just like presenting in organized seminars and conferences but you do it in the BIG way – on television! Remember to use your sponsor name or use your website name so that you can be credited. Good Day! as much as i want to earn some extra income from the comfort in my home. But im so skeptical since i tried other home based job.It doesnt work specially in our country ( Philippines). What is my assurance that GDI is available in our country? It seems quite simple to me we have a product that everyone wants a website with hosting for $10.00 and a way to make an income .The hardest for most people is advertising or promoting your site.Here are some tips i have picked up that work.
!) write articles they cost you nothing but time and work to drive traffic to your website. Don1t forget to leave your website in your signture at the bottom of the article. 2) Place ezine ads there is a small cost for around $30.00 you can submit your ads to two ezines with 10,000 targeted customers viewing your ads.